My dear Fathers, I wish to thank and congratulate Fr. Roy Clarence and his team for organizing the grace-filled event of Fr. Augustine Vallooran’s prayer service on the 9th of September 2018 at St. Mary’s Church, Ampitiya. All those who attended the day’s program were inspired and immensely benefited spiritually from the experience. Thanks to, meticulous arrangements made by Fr. Roy and his team, as an event that was organized to mark our second year dedicated to St. Joseph Vaz, the prayer day gave additional impetus in our efforts to bring about a deep renewal in the faith of our people. Let us continue our programs at all levels with zest and enthusiasm. We are greatly encouraged by the response from our lay faithful. We are now looking forward to the arrival of the Cross of St. Joseph Vaz from Galgamuwa. From the reports we receive regarding the Tour of the Cross in other dioceses, this pilgrimage with the Cross has been welcomed with great devotion by the lay faithful. Our team led by Fr. Nerio Abraham has had several meetings already and has worked out the details of the Tour of Galgamuwa Cross in our Diocese. I wish to request all Parish Priests in the three vicariates to co-operate fully with the team by getting your parish councils to organize the Tour of the Cross of Galgamuwa which will undoubtedly help our people to further deepen their understanding of St. Joseph Vaz and his tremendous mission in restoring the faith of our forefathers. Please note that the National Laity Sunday is to be observed on the 14th October. The theme will be “The Lord Calls you to be the Mirror of God’s Holiness in the world”. Please announce this to all the faithful on the previous Sunday. Also kindly animate the faithful in the homily on the relevant Sunday. However, according to the decision of the Bishops’ Conference, the readings from Sacred Scriptures and the Presidential prayers cannot be changed for any national level celebration. The readings therefore, have to be taken from the relevant Sunday. In the month of October, we have another important celebration namely the Mission Sunday. It is to be marked on the 21st October 2018. It is an important event and every effort must be made therefore, to awaken our faithful to the missionary spirit that emerges from our Baptismal consecration. I would urge all parish priests and heads of Institutions to organize missionary exhibitions and animation programs as well as prayer services and fund raising projects. We are still at the receiving end of the Pontifical Mission Societies’ contributions in our work. It is time to animate our faithful to contribute generously for our own missionary activities at the parish and diocesan level. Please do not fail to encourage all families to get back to the practice of the family Rosary. It is a simple but a beautiful prayer which has drawn down numerous blessings upon our lives. I take this opportunity to thank all those who are taking up new assignments in our parishes and institutions. God will bless you for your sense of obedience, despite the fact that many of you who are transferred have accomplished so much in your previous responsibilities. Please make sure that handing over and taking over is done according to the inventories maintained in each parish and institution. Wishing you all God’s abundant blessings. The Catholic Bishops’ Conference has decided to take the wooden Cross planted by St. Joseph Vaz in Mahagalgamuwa to selected parishes in the 12 Dioceses island-wide within a period of 60 days, starting from September 1 at 2.00 pm. Addressing a news conference in Colombo last week, Chairman of the National Secretariat of the Cause of St. Joseph Vaz, Bishop Vianney Fernando, narrated the salient features in the 24-year missionary life of the Goan priest, who came to the rescue of the Catholics during the time of Dutch rule in the coastal parts of Sri Lanka. Noteworthy among these events were the miraculous downpour at a period of drought, which the saintly solitary priest for the whole country is considered to have been instrumental in bringing about by his prayer to God on the request of the then ruler of Kandy, the miraculous cure of many afflicted with smallpox and the saint’s personal dedication in nursing the patients afflicted with the disease. The Bishop said that although the body of the saint was buried in Kandy in a place close to the police station or close to the Hindu temple, there was nothing remaining of the saint as a relic. Fortunately, the wooden Cross used by the saint had been preserved in the Galgamuwa hamlet for the past 328 years. 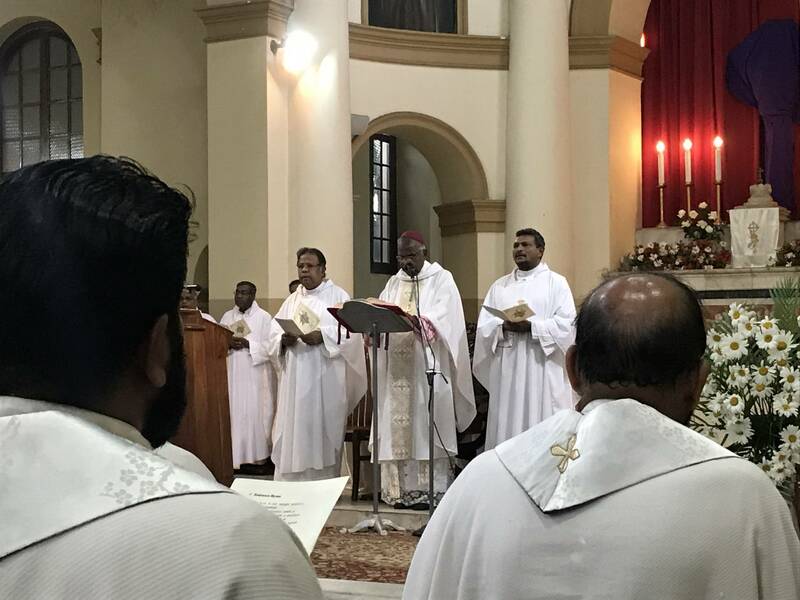 The Bishop said that taking the Cross countrywide was an attempt to inculcate in the hearts of the people the desire to turn away from the materialism of the current world and to return to the roots of a life of deep faith of which the saint was an epitome. The saint had mastered Sinhala and Tamil and his native language Konkani. This endowment and his dedication in serving the people with a Christ-centered universal love irrespective of their caste, race, mother tongue or any other differences endeared him to all the people of Sri Lanka, he noted. “The saint was thus a teacher, who set an example to all of us in contributing our share to solve the national problem now facing the country”. St. Joseph Vaz showed that the solution to all problems center on love and more love to the extent that it comes closer and closer to the love of Christ, who died on the cross to bring salvation to all mankind, Bishop Fernando emphasized. “The Cross planted by the saint to be carried island-wide, will be a symbol of the luster of the life of faith, which the saint lived while on earth and desires that we follow now that he is looking at us from the Heavenly Father in eternity”, he said. Mahagalgamuwa Parish Priest, Fr. Alex Janaka said the Cross will be taken to 102 churches in 35 Parishes in the 12 Dioceses of the country. The first Diocese to receive the Cross will be Chilaw, where it will be taken to selected churches in the Diocese from September 1-7. Similarly, it will be at churches in the Colombo Diocese for 16 days from September 8-24, with September 15 allotted for Holy Cross Church, Gampaha. The Galle Diocese will have the Cross on September 25, while the Badulla Diocese will have it on Sept. 26, 27 and 28 and the Ratnapura Diocese for three days – Sept. 29, 30 and October 1. 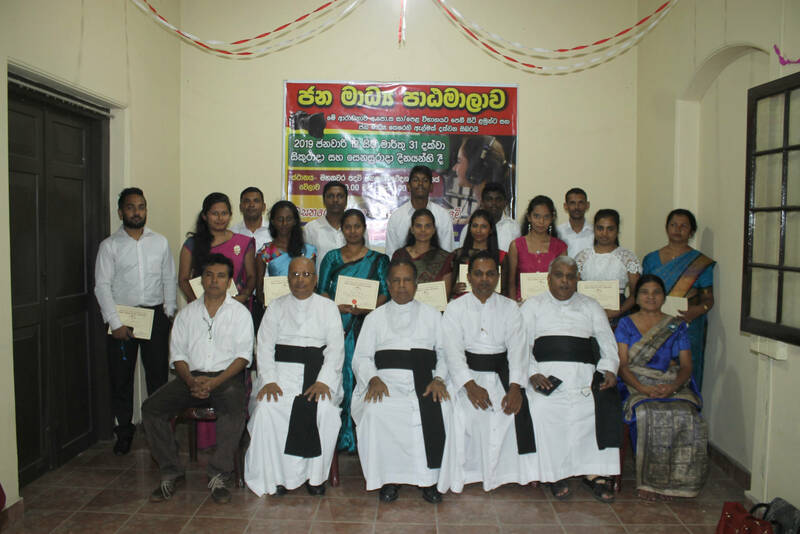 Eight days have been allotted for the Kandy Diocese – October 2-10 and the Habarana and the Polonnaruwa Parishes in the Anuradhapura Diocese on October 11-12. 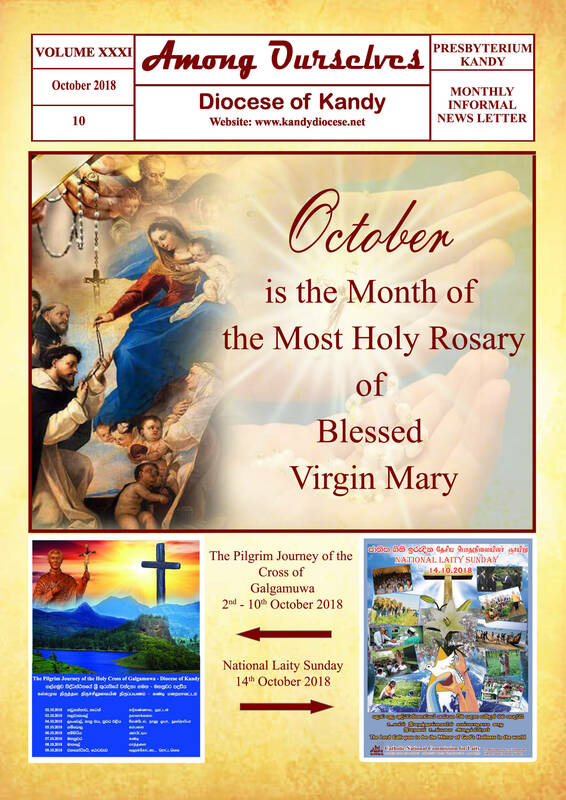 The Batticaloa Diocese has been assigned two days – October 13-15, while the Trincomalee Diocese will be privileged to have the Cross on October 16 and 17. 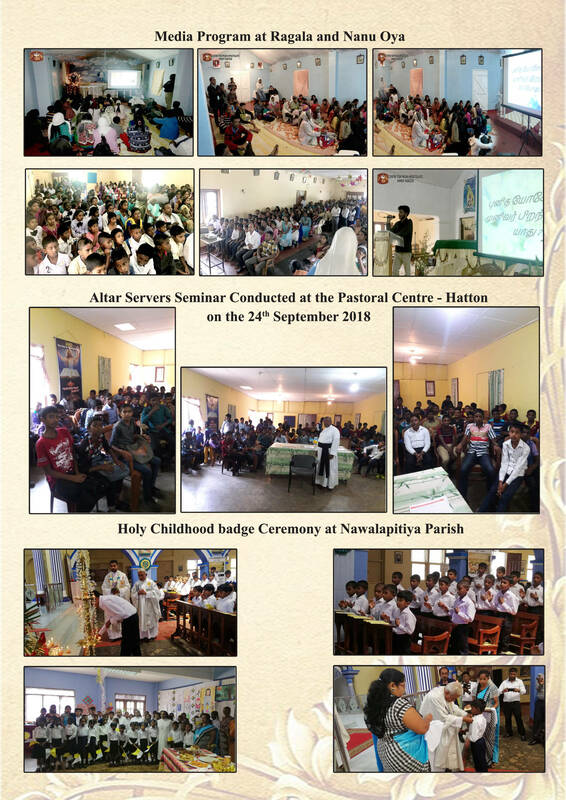 Four days, October 18 – 22 are fixed for the Diocese of Jaffna, while six days, October 23-29 have been set apart for the Mannar Diocese. 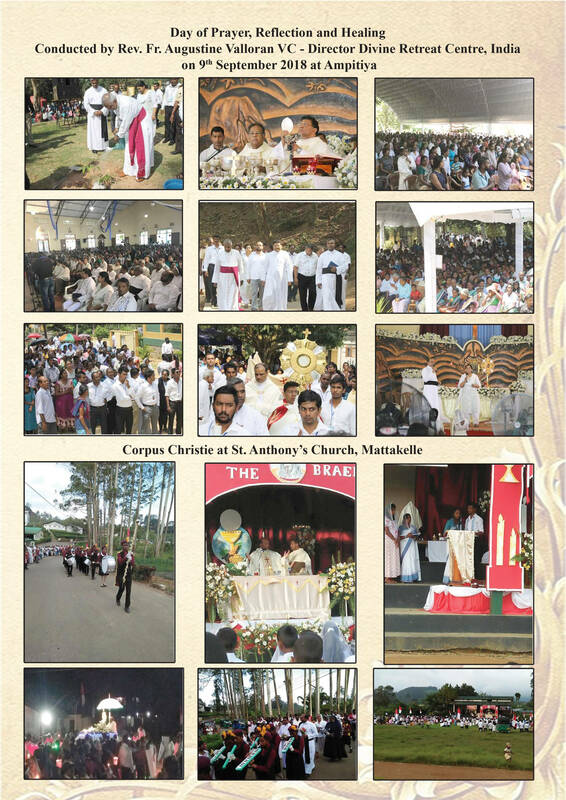 The Cross will be taken again to the Anuradhapura Diocese on October 30-31. The pilgrimage will end with the Cross returning to Mahagalgamuwa on November 1. Born to Christopher Vaz and Maria de Miranda, Christian parents of the Konkani Brahmin caste; the third of six children. Attended primary and secondary school in Sancoale, where he learned Portuguese, and Benaulim, where he learned Latin. He studied humanities at the Jesuit Goa University, philosophy and theology at Saint Thomas Aquinas Academy. Ordained in 1676. Preacher and confessor. Opened a Latin school in Sancoale for perspective seminarians. Always devoted to Our Lady, in 1677 he consecrated himself as a “slave of Mary,” sealing it with a document known as his “Letter of Enslavement”. About this time Joseph learned of the condition of Catholics in Ceylon; persecuted by the Dutch, they had had no priests for 50 years. He sought permission to work in Ceylon, but was asked to go to the mission in Kanara. He accepted, but his thoughts and heart were in Ceylon. Vicar of Vara in Kanara, preaching, hearing confessions, visiting the sick, helping the poor, ransoming Christian slaves, working to settle jurisdictional disputes that interfered with the sacraments. He suffered from acute dysentery, contracted from the terrible travelling conditions, and upon recovery he began his mission by contacting Catholics and hiding from the Dutch. He was taken in by a courageous Catholic, and ministered to his secret flock by night. One step ahead of the authorities, in 1689 he went to the Catholic village of Sillalai and began ministering to folks in surrounding villages. In 1690 Joseph moved on to Puttalam in the Kingdom of Kandy, where 1,000 Catholics had not seen a priest for half a century. He decided to make Kandy the center of his apostolate, and in 1692 he left for there, hoping to obtain royal permission to travel freely. Instead, he was preceded by Calvinist accusations of being a Portuguese spy, and was imprisoned with two other Catholics. There he learned Sinhala, the local language, and since the prison guards left the prisoners alone as long as they didn’t try to escape, he built a hut-church and later a proper church dedicated to Our Lady, and began converting other prisoners. In 1696 the Kingdom of Kandy was suffering a serious drought, and the king asked the Buddhist monks to pray to their gods for rain; there was no ran. He then turned to Joseph who erected an altar and cross in the middle of the square and prayed; abundant rain began to fall, while Joseph and his altar stayed dry. The king granted Joseph license to preach throughout the kingdom. Joseph carried his mission to the main Centers of the island. He returned to Kandy in 1699 with Father Joseph de Carvalho who had been expelled at the instigation of Buddhist monks. He completed the construction of his new church, and went into service for the king, translating Portuguese books into Sinhala. From this vantage point, he intensified his ministry, and converted some Sinhalese notables, which gave rise to slanders against him and persecution of converts..
King Vimaldharna Surya II, Father Joseph’s mentor, died in 1707, but Narendrasimha, his successor, was an even greater supporter. New missionaries arrived in 1708, and in 1710, despite health problems, Joseph took another apostolic trip. On his return, he fell ill from his carriage, and reached Kandy in serious condition. Though he recovered from a series of infections and fevers over the next year, age, work, and disease had finally worn him out. He undertook nine days of spiritual exercises prescribed by the Rule, but before the seventh day, he was called home to God. DIOCESE OF KANDY TOUR OF GALGAMUWA CROSS OF ST. JOSEPH VAZ The Galgamuwa Cross of St. Joseph Vaz is scheduled to tour our diocese of Kandy from the 2nd – 10th October 2018. 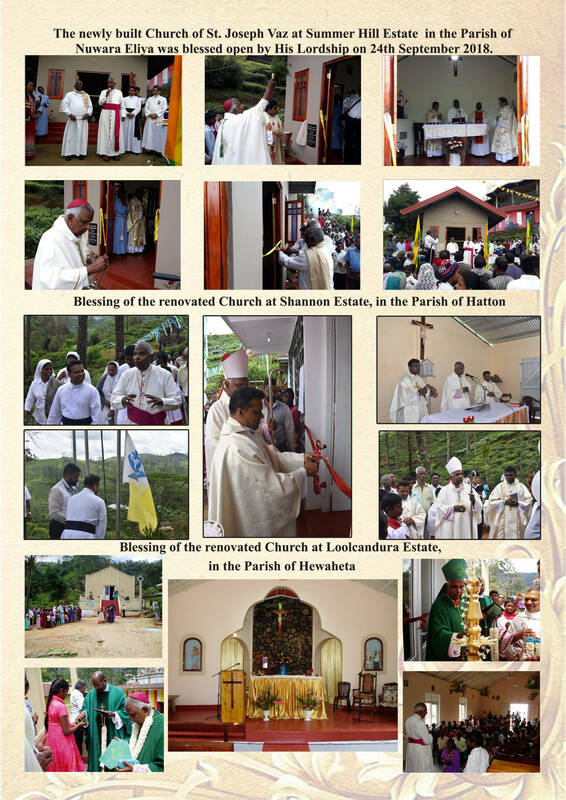 2nd October 2018 (Tuesday) – Receiving the Cross from the Ratnapura diocese [at Kadugannawa] and then proceeding to Hatton. – Night stay in Hatton. 7th October 2018 (Sunday) 7.00a.m. – Leaving Ampitiya Parish 8.00a.m. – Arrival at Kandy Cathedral 8.30a.m. – Holy Mass Night stay at Kandy Cathedral. 10th October 2018 (Wednesday) 9.00a.m. – Leaving from Wahacotte 10.00a.m. – Arrival at Rottawewa Night stay at Rottawewa. “But mummy, were all those poor little babies killed?” little Lily asked her mother. Daisy replied, “Yes darling, Herod was a cruel king and he was jealous and afraid that Jesus would become king. So he ordered the killing of all the babies.” “But mummy, that’s so sad!” “Yes darling, but Jesus escaped.” “Yes, mummy” “Anyway now, it’s time for you to go to bed. I’ll sing you your favourite song,” Daisy put Lily to sleep. Her husband Charles came home. As they were talking, Lily woke up screaming. They ran into the bedroom. Lily was crying, “The little babies … they are going to be killed. They’re calling for help.” They consoled her. “But mummy, I heard them. They were crying for help. They’re going to be killed.” “Relax darling, it was just a bad dream. AUGUST 2018 I’ll sing you your favourite song… Rock­a-by baby, on the tree top … ” Lily fell asleep. Daisy and Charles went back to the living room. Then she told him what Dr. Khanna had said about waiting and not rushing into it. Charles remarked, “You should have told her to mind her own business.” Daisy replied, “I almost did … ” Suddenly they heard Lily’s screams. “Are you crazy Lily? Have you heard of anyone hearing the cry of an unborn child? Can there be anything more absurd? You need to get some sleep.” “You’re right. I’ll go to bed.” That night Daisy couldn’t sleep. All she kept thinking of was the child within her womb and what Lily said. The next day after work without telling Charles, she went back to Dr. Khanna. She asked for a sonography. The result shocked her … She was pregnant with twins. He put her to sleep and came out. Daisy was still crying. He told her that he was sorry and said he too had decided to keep the twins. Daisy gave birth to two healthy little girls. They cared for them well, though they had thought they would not be able to. Lily loved playing with her little sisters.